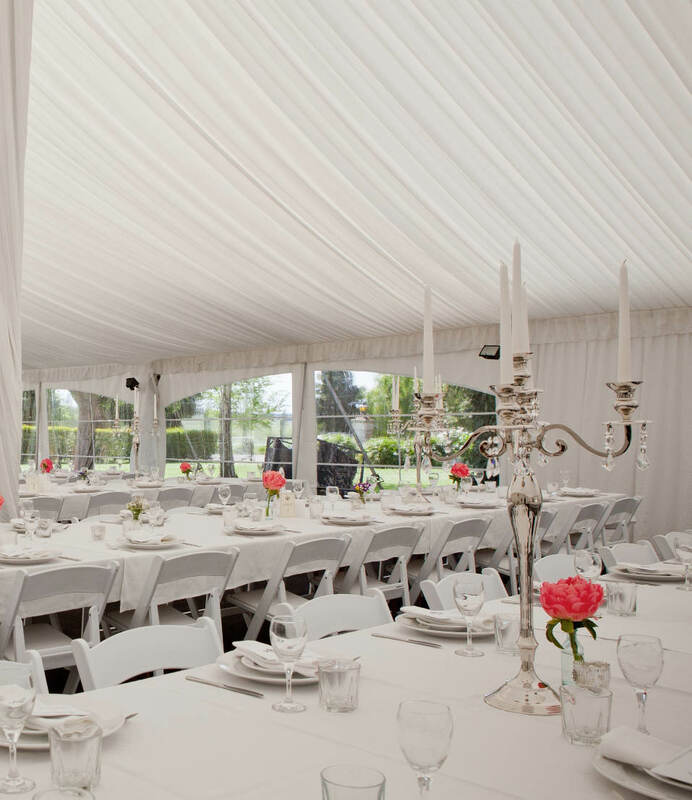 Marquee Wedding & Event Hire Christchurch. Have you thought about having a marquee wedding in the perfect location of your choice? Having your wedding dance on a custom wooden dance floor with a backdrop of silk linings that hang elegantly from the ceiling? Your bridal and guest tables completed with inspirational decorations? Your guests celebrating your special day in a purely luxurious setting? Party Warehouse has several hire packages available for weddings, in Christchurch. Scroll down to view information on our Wedding Marquee Packages, Wedding Ceremony Package and Disco Lighting Packages. 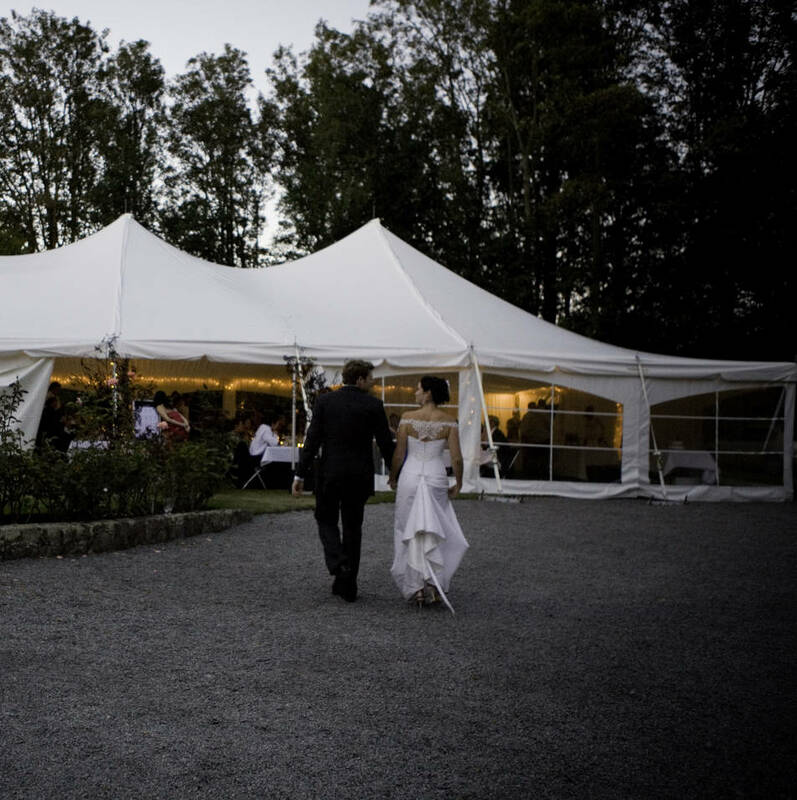 Party Warehouse has simplified the process and lowered the price of hiring marquees for weddings and other formal functions in Christchurch and Canterbury. "The Best Appearance Package" consists of an elegant white marquee (peg & pole or frame) delivered and set up with silk roof, centre pole and wall lining and bayview-clear marquee walls. This silk lined marquee package is highly recommended for weddings. The Best Appearance Package is equivalent to a 10% discount on the hire and the end result is truly stunning. Your guests will be amazed once you have decorated the interior of the marquee with your desired themes and colours. The marquee best appearance package does not include marquee building consent (if required) or equipment inside the marquee such as lighting, heating and furniture. Additional cartage fees apply if being erected outside of Christchurch. Refer marquee Best Appearance Package information page for more information. The Wedding Ceremony Package has been designed to simplify the hiring process for both indoor and outdoor wedding ceremonies. It has merged the most popular decor items (wedding arch, topiary trees, red carpet) required for most weddings. The Wedding Ceremony Package is equivalent to a 10% discount off the total cost of hiring all of these items separately. You are welcome to add more red carpet and topiary trees to this package at a 10% discount on the additional items (eg to hire 6 topiary trees, red carpet and wedding arch, as per above photo, would cost $454.50 (including the 10% discount). You can also add any quantity of white resin (Vienna or Pipee) stacking chairs to the above wedding package and receive a 10% discount on these items too (eg the above setup has 36 Vienna stacking chairs, wedding arch, red carpet and 6 topiary trees. This package would cost $597.00 including the 10% discount). Getting married is the best excuse to throw a party that will be remembered in years to come. In terms of decorating the reception, the only limit is your imagination. Choose a theme that will reflect your personalities and fits in with the rest of the day and start planning early to make sure everything is organised on time. A good theme will create ambiance and set the scene for your guests to enjoy your special day. Party Warehouse has a great range of unique table centre pieces available for hire. From vases and tea light candle holders to candelabras and table runners, we have it all. We have over 30 vases, several styles of candelabras and candle holders, and lots of table centre piece accessories too. Our range is continuously changing so visit our showroom at 133 Blenheim Rd, Christchurch or refer to Vase & Décor Hire for prices and further information. Elegant chairs covers suitable for weddings and corporate events. Presentable and easy to install, our chair covers are especially designed to remain on the chair during the event (cheaper chair covers are prone to slip off the chair during the event which looks unpleasant). Coloured organza, satin and cloth sashes are available to hire in several colours including white, black, burgundy / dark red, chocolate brown, light gold, olive gold, jade green, baby pink, navy blue, sea blue, olive green, pale blue, pink, purple, yellow and silver.